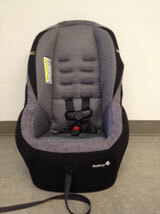 Dorel Distribution Canada (DDC) is conducting a voluntary public notice of the Safety 1st Onside Air LX car seat model 22142CAGK. 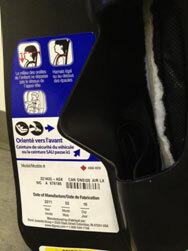 Units produced on March 16th 2011 have an air bag warning label in English only and are missing the slow-recovery energy absorbing material required in Canada. Only units produced on that day are affected. There have been no reported injuries. Failure to follow important safety warnings or improper use of the child restraint could result in increased risk of personal injury during a vehicle crash. Use of the restraint system is not affected where installation instructions as stipulated on the English air bag warning label (which includes a pictogram) and in the bilingual instruction manual are followed. The model number and date code can be found on a label on the side of the shell. Consumers with the affected seats can contact Dorel Juvenile Group for a free pad with the correct label and material by calling toll-free at (800) 544-1108 between 8 a.m. and 5 p.m. EST Monday through Friday.